John Fonte is a Senior Fellow and Director of the Center for American Common Culture at Hudson Institute. 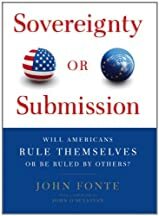 He is the author of a bestselling book about international law, Sovereignty or Submission: Will Americans Rule Themselves or be Ruled by Others? (Encounter Books, September 2011), for which he won the 2012 ISI Henry Paolucci/Walter Bagehot Book Award. Fonte is also co-editor of Education for America’s Role in World Affairs, a textbook on civil and world affairs education widely used in college-level and graduate school teacher-training programs. Fonte’s articles and essays on citizenship, history, civic education, patriotism, assimilation, civil rights, global organizations, American sovereignty, and liberal democracy have appeared in Foreign Affairs, The Chronicle of Higher Education, Commentary, Orbis, National Review, The National Interest, Policy Review, Transaction, Academic Questions, along with a great many national and international newspapers. He has also been a frequent guest and interview subject on CNN, MSNBC, BBC, France 24, Voice of America, Bloomberg TV, NPR, and other broadcast outlets. Fonte previously served as visiting scholar and director of the Committee to Review National Standards at the American Enterprise Institute; senior researcher at the U.S. Department of Education; program administrator at the National Endowment for the Humanities; National Assessment for Educational Progress steering committee member; principal advisor for the Pew Charitable Trusts’ CIVITAS curricular project; and consultant to the Lithuanian Ministry for Education and Science, the American Federation of Teachers, the California Academic Standards Commission, and the Texas and Virginia state education departments. John Fonte holds a Ph.D. in World History from the University of Chicago.